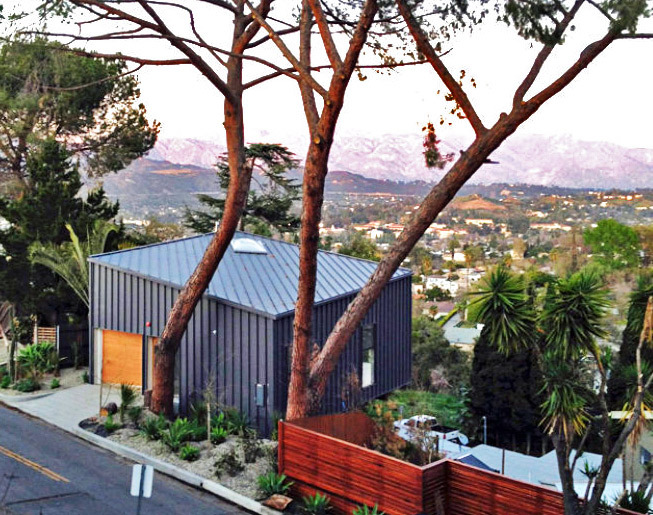 This small hillside lot in the Mt Washington area of Los Angeles is shaped like a parallelogram - so Architects Anonymous created a home with a similarly shaped footprint. Built up on a pier foundation, the loft-style one bedroom home enjoys views of the neighborhood and makes extra space for a garden underneath. Daylighting, volume and an open floor plan make the BIG & Small House seem much larger than it is. The BIG & Small House is set on a 2,500 sq ft lot, and the home has a building footprint of 900 sq ft with a total of 1,200 sq ft inside. This includes a one-car garage, an open floor plan living/dining/kitchen area, a bathroom and a lofted bedroom. Rather than dividing the space into multiple smaller rooms, Anonymous Architects opted to make the main living space feel luxurious and large. High ceilings create volume and space, while light-colored walls bounce daylight from the windows and skylights throughout the entire home. A large skylight above the bed in the bedroom provides even more light and a view of the nighttime stars. The wall between the lofted bedroom and the living room does not go all the way to the ceiling. This opens up the space and allows light to bounce from room to room. The garage and entrance are located at street level and the house juts out over the slope on concrete piers. A low-maintenance, drought-tolerant garden is planted at the entrance and the space underneath the house offers additional yard space, further maximizing the lot. The shed-like volume with a one-pitch roof is clad in standing seam metal roofing and siding which will require practically zero maintenance throughout the life of the home. 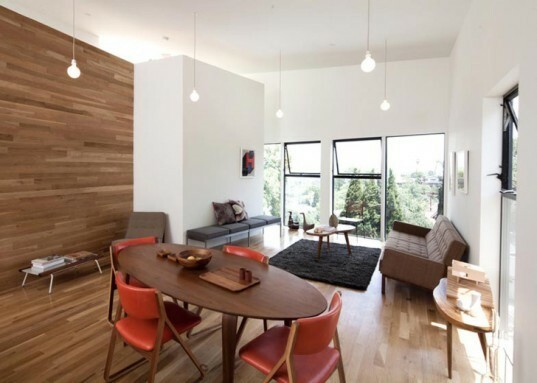 White oak floors and wood paneling add interesting details and warmth to the small home. While 1,200 sq ft may not qualify this as a tiny home, the lessons learned from this project are certainly worth repeating in the design of other small houses. this is not very impressive. there is a TON of wasted space. no closets, no modular wall storage, looks like a shipping container from the outside. I could take that small space and convert it into a mansion with 10 mins of design planning. Love the natural daylight! Have they heard of Ciralight SunTrackers? Very cool, bright daylighting device. Worth checking out. The BIG & Small House is set on a 2,500 sq ft lot, and the home has a building footprint of 900 sq ft with a total of 1,200 sq ft inside. This includes a one-car garage, an open floor plan living/dining/kitchen area, a bathroom and a lofted bedroom. Rather than dividing the space into multiple smaller rooms, Anonymous Architects opted to make the main living space feel luxurious and large. High ceilings create volume and space, while light-colored walls bounce daylight from the windows and skylights throughout the entire home. A large skylight above the bed in the bedroom provides even more light and a view of the nighttime stars. The wall between the lofted bedroom and the living room does not go all the way to the ceiling. This opens up the space and allows light to bounce from room to room. The garage and entrance are located at street level and the house juts out over the slope on concrete piers. A low-maintenance, drought-tolerant garden is planted at the entrance and the space underneath the house offers additional yard space, further maximizing the lot. The shed-like volume with a one-pitch roof is clad in standing seam metal roofing and siding which will require practically zero maintenance throughout the life of the home. While 1,200 sq ft may not qualify this as a tiny home, the lessons learned from this project are certainly worth repeating in the design of other small houses. Bottom floor plan of the BIG & Small House. The loft bedroom is located on top of the garage.